Have you ever asked yourself, why do consumers buy one product over another? Is Brand X truly superior to Brand Z? Or is there a psychological “trigger” that convinces our subconscious to view Brand X as more desirable? And if so, can we use this psychological trigger to sell move effectively? The answer to this question and more can be found in Selling Outside the Square. In this book, veteran real estate broker and author Bob Boog writes about 12 powerful psychological triggers discovered by researchers that act as shortcuts to making a buying decision. 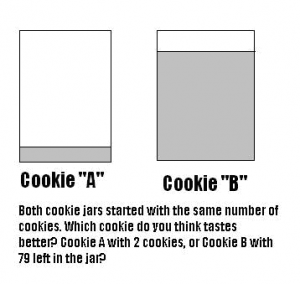 Note: in the example above – both cookies came from the SAME cookie jar, but MOST people declared that Cookie A tasted better! Why? Because people were TOLD that both cookie jars started out with the same number of cookies! These psychological shortcuts can enable salespeople to help sell more products, or help the average Joe avoid being taken. In this interesting book, Boog also identifies the current, largest buying population in America and Europe and unlocks their inner thoughts and core beliefs. He then describes how to utilize the 12 psychological triggers to sell to them and adds some timely field-tested marketing tips. Entertaining, inventive, lively and embellished with curiosity as well as a bit of humor, Selling Outside the Square is a surprisingly genuine yet engaging book that you’ll want to share with a friend!